Pain relief from: headaches & migraines. Gets to work in just 5 minutes - based on caffeine absorption data. Triple action. Aspirin - targets source of pain. Paracetamol - helps block pain signals. Caffeine - helps speed up pain relief. Whether you're suffering from a tension headache or a migraine, Anadin Extra can help fight your pain. 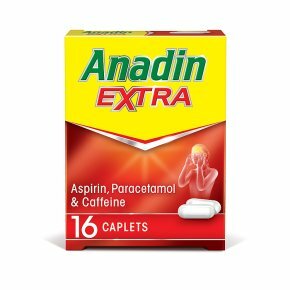 Anadin Extra is scientifically developed with a powerful triple action formula - aspirin, paracetamol and caffeine - for effective relief of headaches, aches and pains. Anadin Extra gets to work in just 5 minutes* and is available in two formats tailored to your preference: caplets and soluble tablets (*based on caffeine absorption data). For relief from: Headache, migraine, period pain, back pain, muscle ache & pain, rheumatic pain, fever, toothache, cold & flu symptoms Also provides relief from: lower back pain, stiffness, sciatica, sprains, strains, joint swelling, neuralgia, fibrositis and a sore throat. Instructions for use: Please read the enclosed leaflet before taking this medicine. The minimum effective dose should be used for the shortest time necessary to relieve symptoms. Take only as much as you need to relieve your symptoms and leave at least 4 hours between each dose. Adults, the elderly and young persons aged 16 and over: Take 2 tablets with a drink of water Then if necessary take 2 tablets every 4 hours. Do not take more medicine than the label tells you to. If you do not get better, talk to a doctor. Do not take more than 8 tablets in 24 hours. Do not give to children aged under 16, unless on the advice of a doctor.<br><br>Contains paracetamol, aspirin & caffeine <br><br>Please read the enclosed leaflet which provides further information about this medicine.<br><br>Do not take anything else containing paracetamol while taking this medicine. Talk to a doctor at once if you take too much of this medicine, even if you feel well.<br><br>Keep all medicines out of the sight & reach of children.